Since April 2007 we have taken catering in-house therefore all school meals are prepared on the premises by own cooks. They offer children a wide variety of healthy foods and ‘cook to order’. We promote 'healthy eating' and children have a guaranteed choice through a band system of either: meat / fish option; a vegetarian option. We also offer a roll / sandwich / wrap option as well as a jacket potato option. Each day there is a choice of vegetables or salad bar to encourage children to make healthy choices. For dessert there is a choice of fresh fruit, yoghurt and the occasional delicious pudding. Check out the Menu at the top of the page and on the Parents’ Notice board outside the main office. Meals must be paid for in advance, preferably termly, half-termly or weekly and, in an emergency, daily. This helps to save considerable administration time by the office staff and your co-operation would be much appreciated. Please send money or cheques, made payable to 'Oakfield Primary School', to school with your child in a labelled envelope. 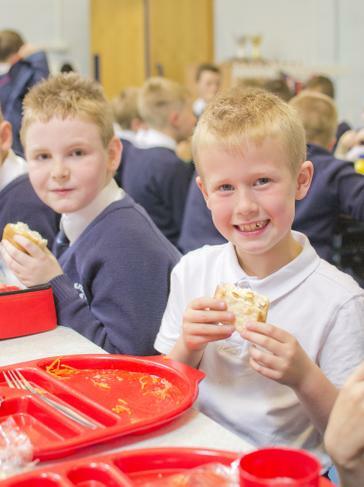 If you are receiving Income Support you may apply for Free School Meals for your child by asking at the school office for the necessary form. Children can bring their own packed lunch including a drink to school. As part of our healthy school programme we ask parents / carers to work with us to ensure that packed lunches contain healthy options (i.e. fruit and / or vegetables and no sweets or chocolate or fizzy drinks). Please make sure that your child's lunch box is clearly labelled. We have several pupils who have nut allergies and to protect them Oakfield is a 'nut free zone'. Please do not send your child with peanuts or peanut butter sandwiches.